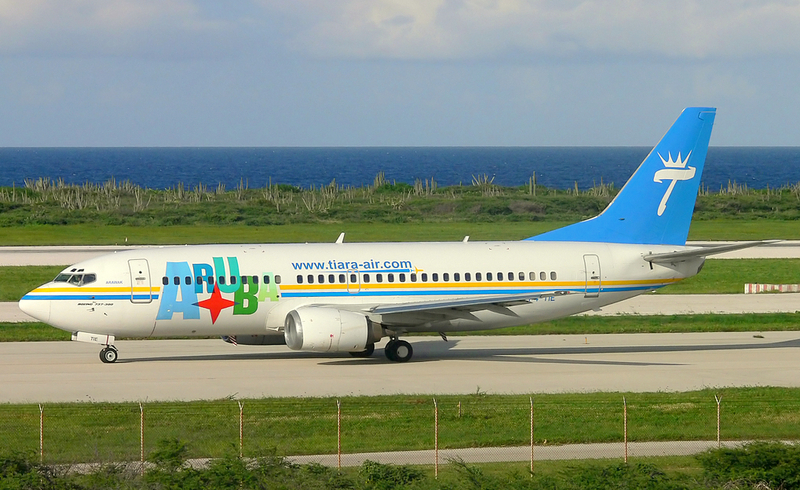 Tiara Air Aruba operates one Boeing 737-300 to several international destinations. ORANJESTAAD, Aruba–The Aruban airline, Tiara Air recently filed for an automatic stay which will prevent creditors and collectors from trying to collect debts from the ailing air company. Tiara Air N.V., operating as Tiara Air Aruba, is an airline headquartered and based on the grounds of Aruba, in the Dutch Caribbean, which began operations in 2006. The airline currently operates scheduled flights to Bonaire, Colombia, Curacao, Fort Lauderdale and Caracas, Maracaibo and Punto Fijo in Venezuela. The airline operates a fleet consisting of the Shorts 360 and one Boeing 737-300 aircraft for passenger operations, with a Learjet 35 for ambulance and private operations. The airline has been camping with financial trouble for a while now. The government headed by Prime Minister Mike Eman has recently approved a bridge loan from a special emergency fund to keep the airline operating while waiting for the Venezuelan Commission for the Administration of Currency Exchange (CADIVI). CADIVI is one of the main causes of financial problems for various airlines in the Caribbean region, including the Curacao airline Insel Air. According to CADIVI reports, Venezuela owes Tiara Air about 40 million dollars.The automatic stay will give the company the required space to adjust its operations and to reduce its flights to Venezuela. The airline announced that it will increase its operations to Curacao, Bonaire and Colombia. The airline had expansion plans into Panama and Costa Rica, but at the moment new routes are not considered. The Netherlands Antilles have lost several national airlines: ALM Antillean Airlines (Antilliaanse Luchtvaart Maatschappij) that ceased operations in 2001, Air Aruba that ceased operations in 2000 and Dutch Antilles Express ceased in 2013. This entry was posted in Aruba, Caribbean Airlines, Curacao, Dutch Caribbean, Netherland Antilles, Tiara Air and tagged Aruba, Boeing 737-300, CADIVI, Colombia, Fort Lauderdale, Oranjestaad, Tiara Air, Venezuela.